More than 150 years ago, a spring-fed creek flowed through the Las Vegas Valley, creating an oasis in the desert. With the only free-flowing water and grass for miles around, the site attracted the native Paiute as well as traders, emigrants and gold seekers traveling the Old Spanish Trail to California. The Spaniards called the place las vegas, which is Spanish for the meadows. Archeological excavations of the fort site revealed pottery shards, stone tools and projectile points of both Anasazi and Paiute origin. A high concentration of artifacts was uncovered directly north of the northeastern fort bastion, suggesting the presence of a campsite that was intermittently used for centuries prior to the arrival of Euro-Americans. By the 1830s the meadows of Las Vegas had become an important stop on the Old Spanish Trail, the notoriously treacherous route broken in by yearly mule caravans that traded between two far flung outposts on Mexico’s northern frontier: Santa Fe and Los Angeles. 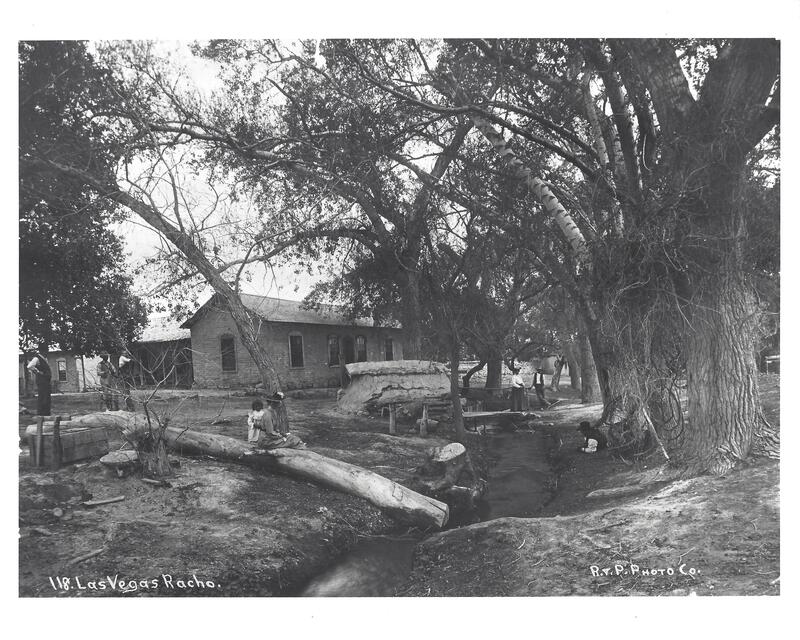 The Las Vegas springs and creek, which flowed along the southern boundary of the modern site, proved to be a very welcome amenity for the traders, mountain men and horse thieves passing through on the trail. The Mexican-American War, as well as the Mormon settlement of Salt Lake City in 1847, caused a reorientation of the Old Spanish Trail’s eastern terminus from Santa Fe to Salt Lake City. Mormon travelers began passing through the meadows of Las Vegas almost immediately after settling northern Utah due to the need to procure supplies from southern California. With the sudden increase in freight and emigrant traffic on this trail, and the need for security on this vital trade route, the settlement of Las Vegas became a practical step for the expanding Mormon state. 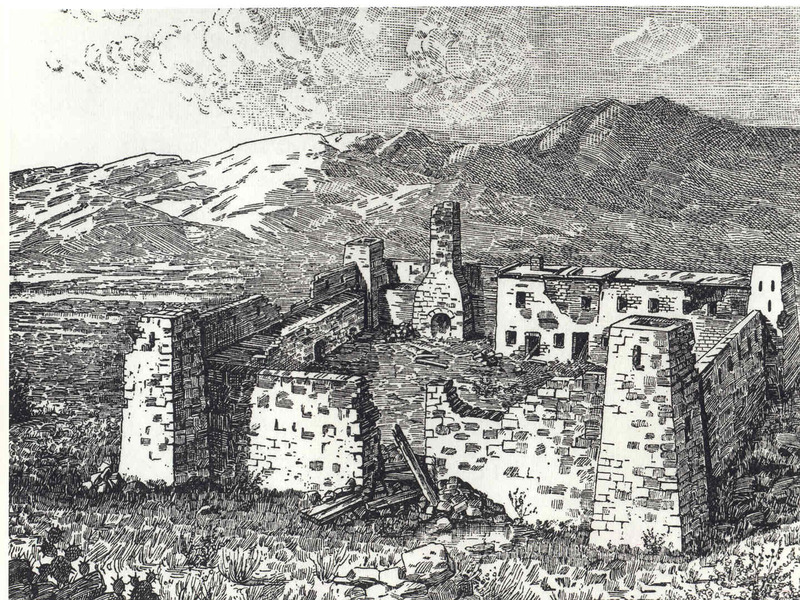 In June of 1855 thirty Mormon settlers led by President William Bringhurst arrived at the meadows and with the assistance of the local Paiute population began construction of a fort structure along the creek. The fort was made of adobe bricks and, when completed, consisted of four walls 150 feet long, two bastions and a row of two-story interior buildings. Parts of the original eastern wall and the southeast bastion remain preserved on the site today. The settlers diverted water from the creek to irrigate farmland and constructed an adobe corral directly north of the fort. However, crop failures, disappointing yields in nearby lead mining efforts and dissension among the group’s leaders caused the settlers to abandon the fort in March of 1857. While the Mormon settlement of Las Vegas proved unsuccessful, their legacy continued in the adobe buildings they constructed. In 1861 the fort was used as a store for travelers by Albert Knapp, and in 1865 Octavius Decatur Gass acquired the site of the fort to be used as a ranch. Gass became an important figure in the region, serving four annual terms in the Arizona Territorial Legislature and selling food and supplies to the miners at El Dorado Canyon and the Mormon settlers of St. Thomas. Gass lost the ranch in 1881 after failing to repay a loan to rancher Archibald Stewart. Stewart moved his children and wife, Helen, from Pioche to Las Vegas in 1883. The operation of the ranch was continued for a time under the railroad company. From 1929 to 1931 the site played a part in the construction of Hoover Dam when the Bureau of Reclamation leased the adobe building and used it as a concrete testing laboratory. For a time the remaining fort buildings served as residences for several families until being acquired by the Las Vegas Elks, who operated a restaurant on the site. Efforts to preserve the site, headed by the Daughters of Utah Pioneers, proved successful when the City of Las Vegas purchased the property in 1971. The Nevada Division of State Parks acquired the site from the City in 1991 and developed the grounds to include a partial reconstruction of the fort, a modern visitor center and a re-creation of the Las Vegas Creek. The Old Las Vegas Mormon Fort State Historic park remains committed to preserving and sharing the birthplace of Las Vegas with visitors now and into the future.